As only one of the very few that can Mike. I held it for 3 minutes in a 73º ambient setting. 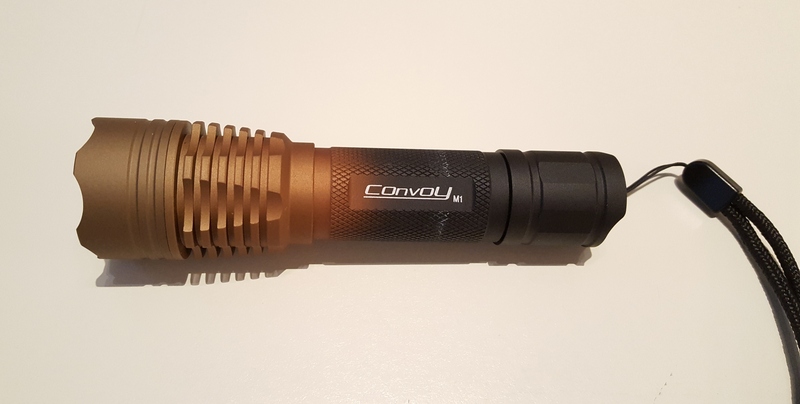 Thanks, so it’s pretty usable for high lumen output. I think I will do something similar with my host. Should probably elaborate, I held it by the head for 3 minutes, it was getting quite warm to the point of being hot indeed. Some cooler night air on it with flow would take it longer, of course. 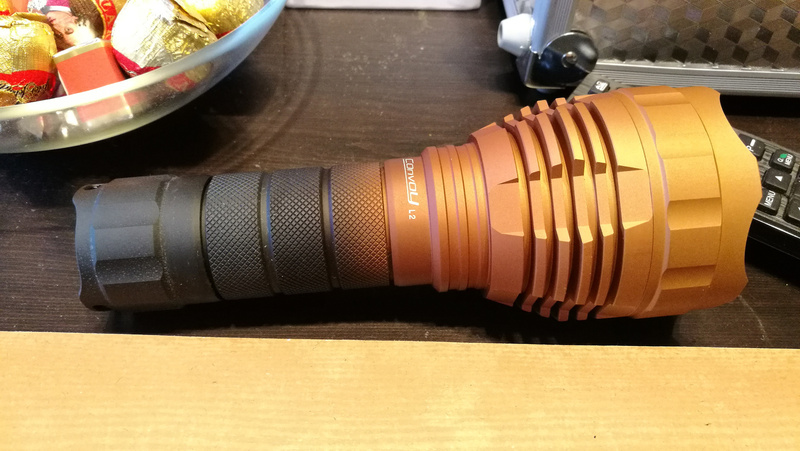 I chose this light as my first full flashlight mod and it makes me feel better when Dale says the word tricky when describing it. Between the e-switch and the way the reflector comes together things are very tight. Needless to say there is plenty here for me to ‘learn’ in just this one single host. I found it easiest to solder longer-than-necessary wires onto the mcpcb, attach the mcpcb to the reflector (loosely, so it doesn’t pull it down tilted due to the centering rings) then put the mcpcb/reflector assembly into the head (with thermal paste) and flip it over to put the central screw in, snugging the assembly into place (have to watch orientation, the mcpcb screw has it’s own cut out in the shelf) Once the driver has switch wires soldered on I cut the leads to length and solder them onto the driver. Everything gets tucked in and the retaining ring installed. After some trial and error this is basically the same conclusion I came to as well. However, since I was not confident in my assembly I kept the longer than usual wires and spent a lot of time stuffing them in the body so I could test before the final “snip”. Needless to say I re-did my solder a few too many times (troubleshooting my switch) and I think I bridged something I shouldn’t have. I was testing with a protected battery and kept getting no light. I got curious and swapped to a VTC6 and needless to say I got something, magic smoke. Pretty much right after I tightened the battery down I could hear the battery was suddenly “loose” in the body. It had instantly vaporized the tail spring including the bypass. Ordered a new driver to get a clean slate and surgery will resume this weekend. 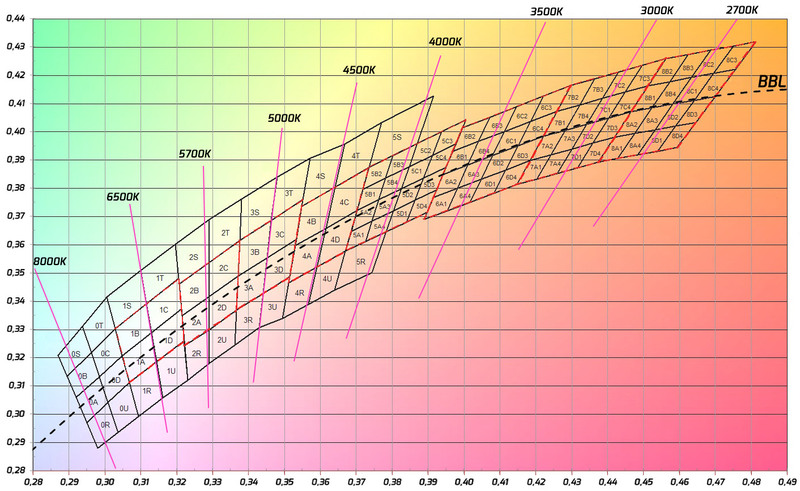 I like the way ZozzV6 did his L2 with the gradient. I was able to do something ‘similar’ on my M1 without much experience. The burnt orange going towards the torch end just seems fitting. My miniature knock off. If I did it again I think I could prevent the bezel (it’s super THIN) from becoming too brown with a little more caution. Has anyone tried XP-L HI in this host? I have XP-L HI in old version with tail clicky. It shoud be comparable. What is a good driver to use with the C8F host? Should I order one from Sofirn or would Richard at Mountain have something suitable…… or somewhere else? Thank’s in advance for any info. I was wondering the same thing. But I’m looking for a driver that doesn’t have multiple modes (so I can use Lexel’s rear pressure switch mods with it on my hunting rig). I think Sofirn sells their driver but if you’re looking for serious output, you might grab Richards FET+1. There are a couple e-switch firmware options including the new popular D4 firmware that ships on the Emisar D4 from Hank and written by Tom E and ToyKeeper. Is it possible to bore the battery tube out to fit a 21700. Just noticed this interesting triple. Not at all. The tube is only 22.69 mm diameter at the tail end and that is including the cut thread depth. 18.88 mm ID on mine. Which brings me to ask a question… Has anyone else had a very difficult time in unscrewing the tail cap internal retaining ring/ I have 2 and have not been able to unscrew either tail cap retainer ring. These just look great! How are you doing it, in an oven or with a torch? I am having trouble understanding how you are getting it to gradually fade from the black to orange. BUT… is sure looks nice. Use some translucent rings and super glue. PS: Magnet is strong enough for this C8 with SS bezel. Maybe not for the Sofirn triple. Nice job. Do you have some pics from assembly how everything fits? No, but i will make another one, i will take pics and post it. That looks super nice Jerommel!!! . I’ll be looking forward when you have the time to do the next one and post pictures. I dont have one but is it left hand thread? but can’t find for sure who said it or where….. yet. I thank you for that tidbit of info. I did get it removed just now. My retainer ring was quite snug after all the “loosening” attempts I had done. I never dreamed it could be a left hand thread. If I read that I completely forgot it. Thank you all very very much. I think Sofirn sells their driver but if you're looking for serious output, you might grab Richards FET+1. There are a couple e-switch firmware options including the new popular D4 firmware that ships on the Emisar D4 from Hank and written by Tom E and ToyKeeper. I looked at Richard's stuff some and I'm glad to see an option or two. Although I am still navigating my way re. understanding many driver features, the one thing still alluding me is output (and I'm starting to understand that specifications aside- you often have to try it to know). Being a newbie and wanting to get started with something in a working model-- I ordered the newer KDlight C8 (with the XHP50.2 in a 5K @ 2600 Lumen) because THAT driver got great marks on output and efficiency. I wish it didn't have the modes it has (since I'm using it for hunting as mentioned), but for the output I figured it would work well enough to get me started. If Lexel (or someone) gets a HIGH output/efficient driver like the one in the KDLight, but in a single mode (on/off)-- I'll be happy with something like that for ONE of these C8F's. I did see Richard's $20 driver which (I think) would do this (and I LOVE the thermal management I read about on it), so might get one for my final hunting rig (which would end up using ONE of these two C8F's). OK, dumb question (#357 )... Does the driver for these C8F kits HAVE to have taps for the switch? Or can it be hard wired in at some point? Thank you gchart for that info…. Yep… looking for serious output. I think I found it too by following your suggestion to check out Richards FET +1. My first complete C8F has a locked tail cap retaining ring too. Only light that has beat me on disassembly. I kinda gave up but I will give it a GO with Heat a few more times. Yeah I shoulda tried that. THANKS! Got a quality tailcap spring bypass using 20 AWG on my C8F. Some advice please. I am building using the Sofirn host and driver. I did the same thing contactcr did, leave the wires long and try to stuff them down in the open space below the driver. I can get the thing to turn on but only if I don’t have the tube screwed all the way in. That is, if I have the tail cap on tight and the tube body unscrewed it works. If I snug up the tube body it doesn’t turn on. I guess you will want to know what battery I am using but I am not at home right now so can’t tell you. It is flat top that was pulled from a computer battery. Everything works fine if I just leave the tube loose. Is your battery tube on backwards?